Carports are an extremely common form of automobile shelter in warm climates and are found in more limited numbers in colder climates, as well. Carports are inexpensive to build since they have no walls, but they are also much less secure and not nearly as useful as a garage that can be locked and used to store bicycles, sporting goods, lawn equipment, and other household goods. So you may wonder if it is possible to convert your carport to a full-featured garage, and just how you can go about planning such a project. Converting a carport to a garage typically saves about 20 percent over the cost having a contractor construct a new garage—provided the carport's slab, support posts, and roof are in good shape. On average, expect to pay $12,000 to $16,000 for labor costs alone to have a carpenter finish off the walls and install doors. When these costs are added to framing lumber, siding materials, windows, garage door, and entry door, and electrical service upgrades, permits and dumpster fees, total costs range from $25,000 to $60,000 for professional installation. A good DIYer may be able to cut these costs in half, but it is always best to have a professional install the garage door itself. Under the right circumstances, a carport can successfully be converted to an enclosed garage, but there are many issues to consider before you solicit bids or decide to tackle such a project yourself. Check Your Local Building Code and HOA Regulations. Find out if the project is allowed and what you may need to do to get a permit. Your community's building code or your neighborhood homeowner's association (HOA) likely will have some regulations regarding garages. For example, a garage attached to your home will likely need a fire-rated wall on the house side, as well as an entry door into the home. If your carport has a shingled or tiled roof and the vertical supports holding the roof in place seem sturdy and are in good shape, there is good reason to think that the structure could be framed with walls and doors and turned into a serviceable garage. But if the support posts are damaged or leaning, or sized too small, it may not be possible to convert the carport—unless substantial structural improvements are made. The better the condition of the carport, and the sturdier its structure, the better your chances for successful conversion. At a bare minimum, a garage should be 20 feet deep, with a width of 10 feet for one car or 18 feet, 6 inches for two cars. A more comfortable garage would add 2 to 4 feet to each of these dimensions. These days, garages even larger than this are common, and it's possible you may want to expand the slab to create a bigger footprint, provided there is enough roof overhang. Will there be room for a horizontal header above the garage door opening? 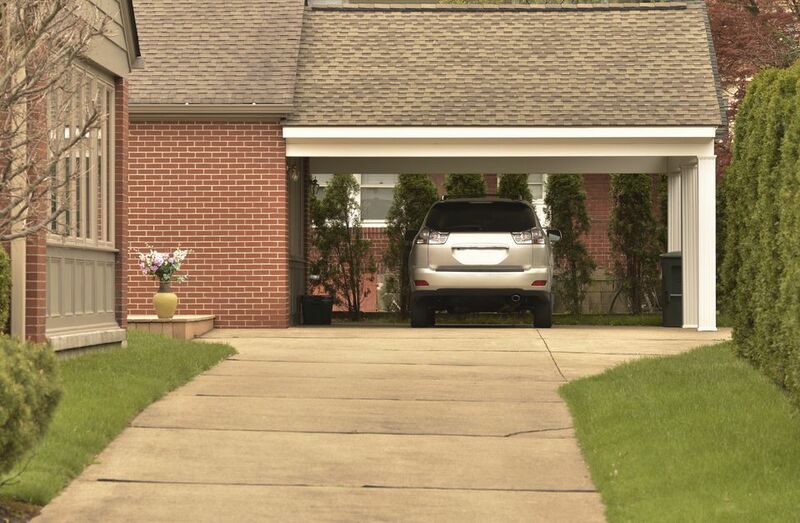 When you enclose a carport to form a garage, you will need a sturdy beam, or header, across the drive-through opening. A standard garage door requires a rough opening 8 feet 1 inch high, with a double-thick 2-by-8 or 2-by-12 header spanning the opening. Your existing carport needs to have sufficient height to allow for this, or you will be faced with much bigger costs associated with raising the roof. Carports are usually built with either a gable roof—an inverted V-shape—or a shed roof. Try to imagine what the converted space will look like with the existing roof. A shed roof may look fine for your open-sided carport, but this makes for an unusual and not very attractive roof when a carport is enclosed as a garage. If you plan to keep the existing roof, have a contractor, home inspector, or structural engineer examine it. If the roof is in poor condition, you might want to remove it entirely and start your garage project from scratch. You may be able to save money by reusing the slab, however. If the roof structure is in decent shape, you may be able to simply re-shingle the roof as part of your conversion project. Is the concrete slab under your carport structurally sound? Is the footing wide and deep enough? Though the slab surface may seem fine, the perimeter foundation may not necessarily meet current code requirements for supporting framed walls resting it. Once you apply for a new building permit, you may be required to address that issue. A structural engineer or concrete contractor may be able to inspect your slab and tell you what kind of foundation you have and if it can bear the weight of garage walls. Determine in advance how electrical service will be delivered. Some form of electrical service is required in any garage, and if you plan to use the space as a workshop of any kind, this could involve running several new circuits or even installing an electrical sub panel. And if you want to add plumbing for laundry or other purposes, talk to a plumber about your options before proceeding with your conversion. If the answers you get when considering these eight issues tend toward thumbs-up, then it's time to consult a builder to find out about costs for such a carport conversion project. Go into the process with your eyes wide open. It's also a good idea to get bids for a complete teardown of the carport and construction of an all-new garage, just to make sure that conversion is the best option.